The theme for this year’s AAM Annual Meeting was “The Power of Story.” The lectures and discussions looked at the different ways that museums tell stories—through their collections and exhibitions—and how storytelling can be a tool for engaging new audiences. I was a panelist at the behest of the Walker Art Center, which had proposed a session on how museum websites and digital initiatives are transforming audience engagement, content production, and institutional identity. In other words, how we can use digital content to tell stories in exciting new ways. 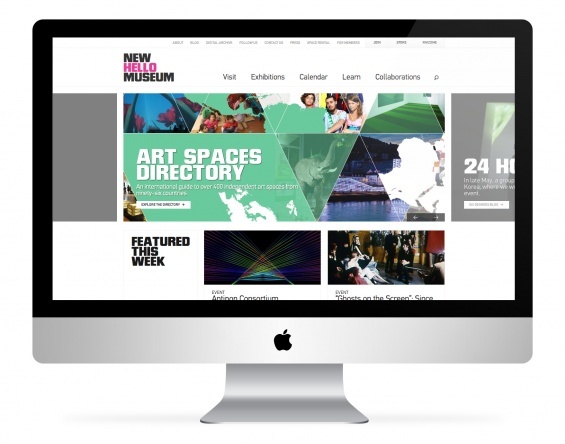 Ryan French, the Director of Marketing and Public Relations at the revered Midwest contemporary art space, had called me; the Smithsonian was already on board and the Walker’s digital team was impressed with the relaunch of newmuseum.org in July 2012. It felt like being asked to the prom. At the New Museum, we have long admired and envied the Walker’s ability to be ahead of the curve with their branding, publications, and digital strategy. The invitation was an affirmation that after two years spent reconceiving our online strategy we were on the right track. The format was simple: each of the participants would speak for ten minutes and lay the groundwork for forty minutes of Q&A and a substantive professional exchange. Presenting on behalf of the Walker was Paul Schmelzer, the Walker’s Web Editor since September 2011 and formerly the Editor of Walker Art Magazine from 1998–2007)—he has also won numerous awards for his writing. I belabor his CV because it is an indication of how seriously the Walker takes its website’s content production and management. For the Walker’s blogs, Schmelzer commissions writing from special guests, regular contributors, and institutional staff. These are distributed across nine different channels, each with a specific focus, including education, new media, and the local Minneapolis art scene. On the Walker’s homepage, Schmelzer is also responsible for selecting and aggregating “Art News from Elsewhere,” which features current articles about culture from a variety of sources (and has been nicknamed the “Idea Hub”). 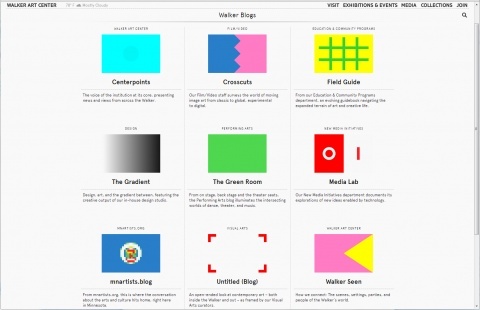 The Walker took a huge gamble: to turn a museum website on its head and transform it into an editorial vehicle. They present original content and borrowed content from other valued sources, and it has paid off handsomely: The Walker’s website doubled its unique visits from two million to four million in just one year. Schmelzer’s most revealing argument, derived from statistics gathered from the Walker’s website, was the long tail concept of original editorial, which strives to understand the ongoing readership of online content. He said there is a misconception that articles are posted, widely read in the first ten days, and then die. Their data reveals that there are two weeks of intense activity when a feature is first posted (i.e., readership is around twenty-five to one hundred visitors daily), then nine weeks of bubbling (i.e., five to twenty-five readers per day), and then a year of one to two readers per day. When you add it up, the readership in the first two weeks equals that of the next nine weeks equals that of the next twelve months. His conclusion: good writing always has an audience. The other statistic to note was why people were visiting the Walker site. Looking at website statistics from peer institutions, more than 50 percent of their audiences go to their websites to plan a visit, only about 10 percent browse casually. On the Walker’s site, about 30 percent of visitors are planning a visit to the physical museum, while 33 percent are browsing casually—supporting their strategy that they are a hub for the must-read art stories of the day. In comparison with the Walker’s focus on contemporary art and their online audience of about four million and gallery attendance of two hundred thousand, the Smithsonian’s National Museum of Natural History averages seven million onsite visitors and thirty million in online traffic per year. Where do you start with such a huge audience? Robert Costello, the NMNH National Outreach Program Manager, presented on a recent project that began with a $30,000 budget to develop an online educational feature (designed in-house) to attract teenagers to engage in forensic science. The project was an outgrowth of a major exhibition entitled “Written in Bone.” The show demonstrated how twenty-first-century forensic science could be used to examine seventeenth-century bones excavated from sites in North America and tell stories about the past. As a complement to the exhibition in the galleries, they created a webcomic called The Secret in the Cellar, which tells a story with characters that teens can relate to, poses questions, and connects to social media. Time spent on this project site is double that of other popular NMNH sites. The most salient statistic was that when the site launched, it had abysmal traffic and very little marketing, but through word of mouth—from watercooler conversations among science teachers to comments on social media—the site has gained more users in the ensuing two years with a total of 320,000 unique visits. The New Museum was the smallest museum by comparison, so I thought it was important to emphasize how to work with limited resources. I recounted the yearlong process of internal discussions with each department, from Curatorial to Development to Education, to evaluate what was needed now and in the near future. After this period of assessment, we plunged into what we thought would be a six-month build out that turned out to be nine months—finally launching in July 2012. Since then, our online visitorship has increased by 30 percent. Part of building this new audience are two innovative initiatives: First Look, an online only gallery for new digital artwork; and the Art Spaces Directory, a unique resource that contains descriptions of and contact information for hundreds of independent art organizations around the world. First Look allows the Museum to mount additional exhibitions without the costs of presenting work in a physical space (shipping, installation, security, etc.). The Art Spaces Directory first took form in a printed book, published in 2012. By translating the content into an online format, the Museum can keep the content of the book up-to-date without the complications and expense of paper publishing. The increasing page views of both sites over the course of the last year indicate these online projects are gaining traction. But there are challenges: Commissioning new online art for First Look each month takes funding, while the Art Spaces Directory has received dozens of requests from new spaces—expansion that requires increased staffing. The Walker, the Smithsonian, and the New Museum are all facing a similar challenge: When you create a site that is its own destination, you have to feed the beast. As an institution, how do you balance online efforts with what is happening in the building? Many of our colleagues in the audience were in the midst of reviewing and revamping their own websites, and there was a lot of discussion about how a museum can expand its staff’s job descriptions to include delivering original content to the institution’s website, and about work flow and what it looks like when developing new content. For example, when curators are writing texts for wall labels and exhibition catalogues, what distinguishes their writing online? My takeaway for the day: don’t rush. The Web is here to stay and quality content has a longer shelf life than we think. Good stories will always find a home. The trick is for museums to bridge what’s happening in the museum (i.e., exhibitions and public programs) with the virtual “museum” so that content is expanded and elucidated online in ways that are not always possible in a physical space. Online content can also reach a much broader and geographically diverse audience, who might not be able to visit a museum’s physical location, but can be involved in its activities through dynamic web projects that convey the institution’s mission in different ways. The role of museums online is a new frontier, and the challenge and excitement of exploring how to make a relevant and sustainable website is a mandate with which all museums are grappling.